Just like everybody else, whenever I get on a plane, I go through the TSA line. I go by numerous signs and public announcements – but never read them. I am either in a hurry, or looking at my phone, or just waiting for the guy ahead of me to hurry up. Or worse, I am looking at those disgusting people in the line in front of me. Those of us that travel a lot, get frustrated by those who rarely travel. They don’t know the protocol. They have way too much jewelry on, or they don’t take their laptop out of their bag. Not to mention the liquids. Why don’t they know the rules? Then you get those people in front of you that are just wearing flip flops. They take them off, and then walk barefoot into the scanner. Gross. Those little yellow feet painted on the floor in the scanner where EVERYBODY in line in front of you have put their feet is probably the most disgusting place in the airport. Did you read it, or just go past the picture? 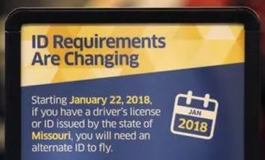 It says that effective January 22, 2018 your Missouri driver’s license will no longer be good enough to get on a plane. It is time to be sure you have a valid passport. I finally can see the advantage of people not reading notices. This TSA change has a potential advantage. I am hoping for shorter lines at the airport come next January because a lot of my Missouri friends with flip flops will be riding the bus.